This is not me, I would not wear a yellow swimsuit, haha. This week I took advantage of Virginia Tech's new Bod Pod, which is a device that estimates lean body mass (i.e. 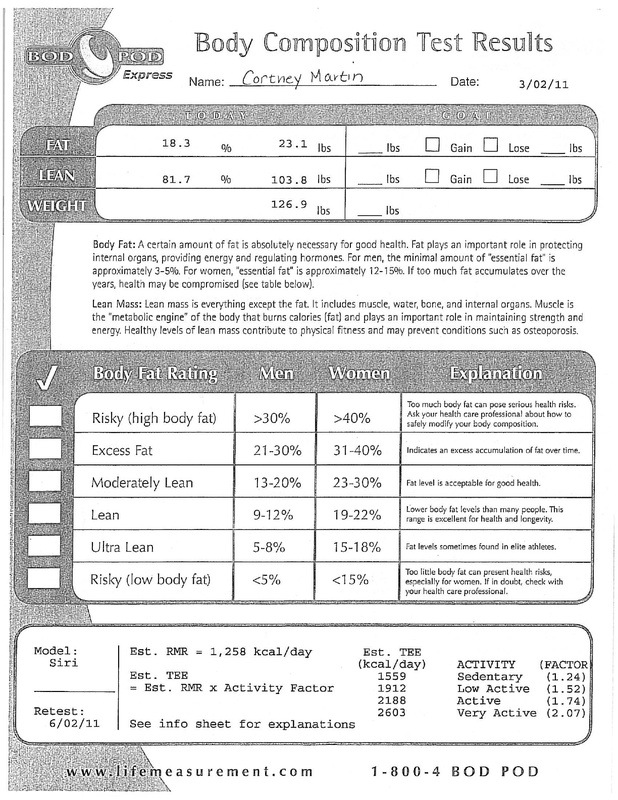 percent body fat) using air displacement. It set me back $12.50 but the engineer in me could not resist!! I love numbers! You are told not to exercise or eat for two hours prior. 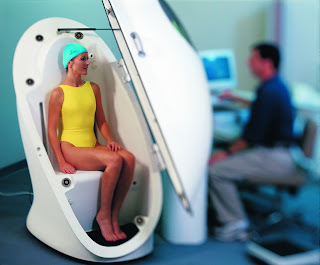 The test only involves a weight measurement and then sitting in the "pod" for a few minutes in a swimsuit. 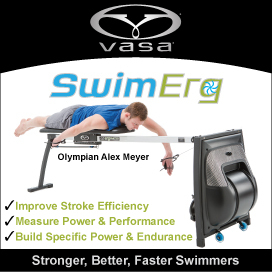 There is sensitive diaphragm between the front and rear pod chambers that is used to measure air volume (and hence how much air your body displaced) which is used to calculate the volume of one's body. I've had a number of skinfold estimates done, which use measures of subcutaneous fat and a formula to estimate lean mass, but there is a pretty big margin of error on the final number - something like 5% - and it's a wider margin if you are at the really high or low end. Skinfolds are great for tracking trends, for instance over the last few months I watched my sub-q thigh "fat" decrease more than any other site telling me that it's where I am most likely storing my extra groceries. With the skinfold, I'd been coming out around 10%, again, at the pretty lean end of the spectrum, giving a potentially larger margin for error. With the BodPod, I came in around 18%. The Bod Pod also claims to measure Resting Metabolic Rate based on your exhaled CO2 levels which gives "the amount of calories required to maintain vital body functions (i.e., heart rate, brain function, breathing). It is the number of calories a person would burn if they were awake, but at rest all day." Mine came out to 1258. Then depending on your activity level, they suggest daily energy needs, so around 2200 for "active". The tester said that if the RMR can come out really low in those who severely restrict calories and over-exercise (read: eating disorder). I'm confident my body is at a happy point of equilibrium with enough wiggle room in there for things like occasional pizza, chocolate, etc. The results don't change anything for me other than satisfying my curiosity and enjoyment of numbers!! !